2011 Glacier Silver Bullion Coins are the second of five 2011 releases in the U.S. Mint’s America the Beautiful Silver Bullion Coin™ Program. 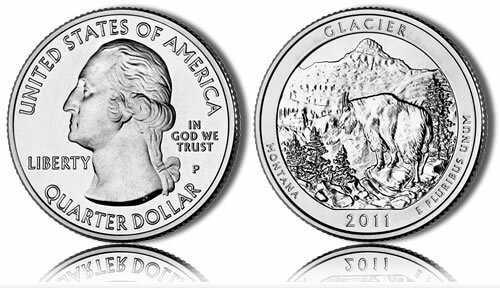 Each of these coins, which honor Glacier National Park in the state of Montana, also represent the seventh strike in the series which debuted in 2010. Struck to a diameter of three inches from five ounces of .999 fine silver, the size of these coins easily differentiate them from the circulating America the Beautiful Quarters™ which share the same obverse and reverse designs. They also feature images and specification similar to an associated Glacier Silver Uncirculated Coin. The United States Mint released the Glacier Silver Bullion Coins on April 25, 2011 along with the first strike in the series for the year, the Gettysburg Bullion Coin. Both were listed with an initial mintage of 126,500 which represented an increase of 93,500 from the strikes of the previous year which only had a mintage of 33,000 per design. According to the Mint, the Glacier Silver Coins achieved a sell-out status on May 16, 2011. At that time, the Mint had recorded a total of 126,700 sold to its network of authorized purchasers. Coins of this series are not be sold directly to the public by the U.S. Mint. Instead, the Mint uses a network of authorized purchasers for all their bullion products. The network buys the coins in bulk from the Mint, then resells them to the public for a small premium above the current spot price of the silver contained within them. Since each contains five ounces of the precious metal, their sale price will be slightly higher than the current market value of five ounces of silver. This also means that the coins will have an intrinsic melt value equal to the market value of those five ounces. Thus, if silver is currently selling for $25 an ounce, these coins will have a melt value of $125 — five ounces times $25 an ounce equals $125. Additionally, coin collectors will pay substantially more for those that have been slabbed by a third party grading systems. Glacier Silver Bullion Coin values will be the highest for those receiving the top "70" grade. The silver coins sales figures page offers recent sales and value information for coins of this series. All of the America the Beautiful Silver Coins feature on their obverse or heads side a portrait of George Washington, the first President of the United States. This design was originally completed by John Flanagan for the 1932 circulating quarter dollar and as been used on quarters ever since (in one form or another). The reverse of the Glacier Coin features a design emblematic of Glacier National Park. It showcases a mountain goat clamoring along the rugged terrain found within the park. The reverse was designed by AIP Associate Designer Barbara Fox and sculpted by United States Mint Sculptor-Engraver Charles Vickers. Edge inscription include the coin’s weight and fineness.